Researchers in ageing knew for some time that the amino acid methionine plays an important part in protein synthesis, and that reducing it from the diet has several anti-ageing benefits. Evidence suggests that a substantial benefit of calorie restriction diets may, in fact, be due to the limited amount of methionine in the diet. Evidence also points to the fact that restricting methionine consumption increases lifespans in some types of animals in the laboratory such as mice, even without calorie restriction. A very good summary of this subject, although a bit old, can be found in the blog of Josh Mitteldorf here. In this article I will briefly highlight some recent developments from research published in the past two or three months. Restricting methionine from the diet results in a decreased production of reactive oxygen species (free radicals) in the mitochondria. It also decreases other non-oxidative stress on mitochondrial proteins. In a study, methionine restriction resulted in increased secretion of hormones protecting the heart muscles, and improved the function of adiponectin (that helps fight obesity) and fibroblast growth factor. Recently, further research confirms that methionine restriction has several anti-proliferative benefits and it may thus be of some use against tumours. Depletion of methionine induces apoptosis through activation of TRAIL (TNF-Related Apoptosis-Inducing Ligand receptor-2) which results in an increased rate of elimination of cancer cells. The authors suggest that combining methionine restriction diets with other specific TRAIL activators may be a suitable method to reduce growth of certain cancers. This is a promising strategy but it needs to be evaluated further. In animals undergoing calorie restriction there is a beneficial effect of insulin sensitivity, adiposity and energy. This is thought to be mainly due to methionine restriction which forms part of the overall caloric restriction regime. It was found that methionine restriction can still result in the above benefits even in the absence of reduced energy from the diet. On the other side if the coin, it is also known that adding methionine to the diet (at least in fruit flies) shortens lifespan. High levels of methionine increase production of free radicals and worsen antioxidant defences. In humans, a vegan diet is believed to be the nearest we can come to a methionine restricted diet. This is because plant nutrients are naturally low in methionine. Nutritionists point out however that it would not be wise to completely eliminate methionine from the diet as this may result in blood and liver abnormalities. The issue of methionine restriction is complicated by the fact that some forms of methionine such as S-adenosyl-methionine (SAMe) are actually beneficial in ageing, and help control depression. However, it must be pointed out that SAMe, is not pure methionine but it is a combination of methionine and adenosine triphosphate (ATP), which make it useful in several metabolic pathways. This indicates a widespread principle in nature, namely that although a compound may be damaging on its own, it may be beneficial if combined with something else, and also that the dose and concentration of a compound may be damaging at one level and beneficial at another. 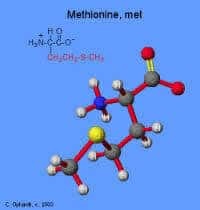 As the effects of methionine restriction show quite an overlap with those of calorie restriction, it may be that we don’t actually have to restrict methionine in our diet in order to reap the benefits. Instead, it may be possible to use mimetics of methionine restriction (as in the case of mimetics of calorie restriction see this paper and my paper. Research in this respect is still in its infancy but I would expect that at least some of the current calorie restriction mimetics would be also doubling up as methionine restriction mimetics. In fact, this may be better than trying to follow a diet that is low in methionine, which is a complicated process of mixing and choosing low methionine foodstuffs. The value of this research may be better reflected in a future pharmacological combination that can induce the physiological benefits of methionine deprivation without the need to interfere too much with the diet. Or just eat plant foods. …or just eat more plant based/vegan food! It really isn’t that hard.